Some of you may remember Mike Henry. 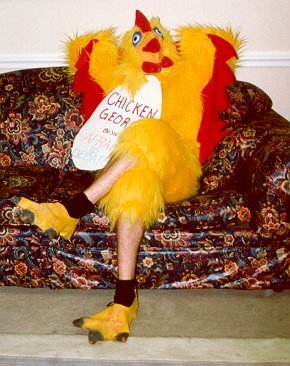 He's the dude in the Chicken Suit below. 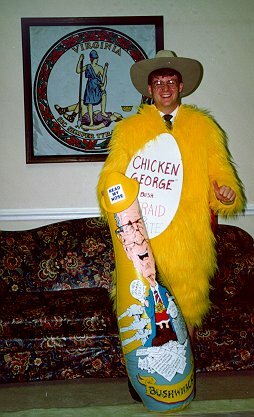 Dianne Martin, who was working at the Virginia Democratic Party headquarters at the time of the Clinton/Gore '92 campaign, remembers "these young Dems playing around with a chicken costume. Mike, now married and a professional political consultant, came back to Virginia to direct the Democratic House Caucus during the 1999 races" (Dianne Martin, electronic mail, March 15, 2000). Mike is now working for Bill Nelson -- the one shining hope for the Democratic Party for the U.S. Senate race this year. Bill is the anticipated nominee for the Democratic Party and he has raised more than $2.2 million to battle the survivor of a tough Republican primary.